THIS WEEK, SPARC BC and the United Way of the Lower Mainland released BC Seniors’ Poverty Report Card. It’s not good news, with 8.8 per cent of B.C.’s seniors living in poverty in 2015. The number of seniors living in poverty in B.C. rose from 34,000 in 2000 to 70,000 in 2015. Sad to think of seniors living out their final years scraping by, worrying about how to pay their rent, groceries or prescriptions. Here in Kamloops, things are better, but still concerning. In 2015, of the 16,800 seniors in our community, 600 or 3.6 per cent lived in poverty. Much better than the provincial average but still not good. In towns surrounding Kamloops, poverty is higher. In Barriere, 5.8 per cent of seniors live in poverty, in both Chase and Ashcroft 6.4 per cent of seniors are below the poverty line. Even in Kamloops, our community is not uniform. Poverty is highest in the downtown core, with 7.2 per cent of seniors there living in poverty, and in the Tranquille Market area, where 7.6% of seniors live in poverty. Compared to this, other areas of Kamloops have much lower poverty rates. Poverty does not affect all seniors equally. If you’re single, you have the highest chance of living in poverty. Seniors living on their own (as opposed to with a spouse or other family) make up one-third of all seniors. But they make up 62 per cent of those living in poverty. It’s not just if you’re single. If you are an elderly woman, you are 50 per cent more likely to have a low income than if you are an elderly man. So the 3.3 per cent of Kamloops seniors living in poverty are disproportionally senior women living on their own. Sad to think of single senior women living out their final years scraping by, worrying about how to pay their rent, groceries or prescriptions. So finding ways of improving the lives of seniors living in poverty in Kamloops is about finding ways to serve single senior women. The City of Kamloops needs to deliver services for these seniors where they are at. First and foremost, accessibility should be increased. Some work is being done on sidewalk cuts in Kamloops, but many intersections in the Tranquille Market area, and at many intersections from Sixth to 12th Avenue sidewalks are still inaccessible for wheelchairs or mobility devices. Second pedestrian access should be prioritized when planning construction. The multi-week long closer of the pedestrian crossing at Tranquille Road and Fortune Avenue is unacceptable. For weeks now, seniors living in the neighborhoods around Tranquille Road and Fortune Avenue have not been able to cross by foot or on wheelchair at this intersection. Seniors living in poverty often don’t have cars. This crossing has cut off seniors from groceries and their pharmacy. Telling people to walk over ½ kilometer to another crossing isn’t feasible for many seniors. Third, more benches are needed. For example, more benches should be added on routes from the downtown core and Royal Inland Hospital for people walking to and from their appointments. Having a bench gives seniors a chance to rest, which many need even for a few blocks. Fourth, the City of Kamloops needs expanded recreational programs in the downtown to give seniors places to socialize and exercise. Many other groups, from the YMCA downtown and at John Todd, to Desert Gardens downtown, to Cottonwood on the North Shore provide great recreational programs. But as more seniors move to the core of the city, the City’s recreational programs need to go where the seniors are. Finally, housing costs is the one of the biggest strains on seniors, with one in five seniors paying more than they can afford. The centre of the City of Kamloops needs more seniors oriented rental housing. The City of Kamloops should provide incentives for builders to build smaller suites with less parking. That would reduce construction costs and make the suites more affordable for seniors. By 2036, Stats Canada predicts the number of Canadian seniors to be up to 25% of the population, or 24,000 seniors here in Kamloops based on current growth projections. At today’s poverty rates that would mean an increase of 44% more seniors living in poverty here in Kamloops. It’s time that the Kamloops’ downtown core and Tranquille Market meet the needs of the seniors that live there. It would be better for them, but better for all of us too. 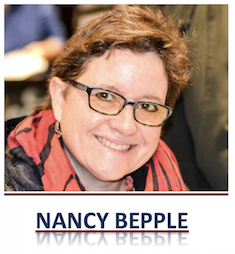 Nancy Bepple is a former city councillor of Kamloops with a strong interest in community building projects. As one myself, I can tell you that there is nothing poorer than an elderly lone woman. I am 81 today with very little to look forward to. You’re one of many Beverly, so we need to make sure the city works for you. Great information about largely hidden issue – one that has huge health care cost. We need imagination and political will. There are many with mobility and isolation challenges at the same time as we have buses running largely empty during off-peak hours. Why not add another dimension to tap on/off technology and public transport? Add tap terminals at civic facilities where transit riders could earn bus credits for visiting selected venues. A poorer senior, living alone without a car, might tap on the bus, ride downtown, do a little shopping, have a coffee with others and visit the library for a spell where they would tap in/out at the library entrance and earn three free bus credits good for off-peak travel on public transport. What’s gained there? A downtown visitor, increased ridership (at little incremental cost), more visitors to civic facilities and most important an isolated person who gets out and engages with community. And somehow someway we need to reach young people about providing for themselves in their senior years. It needs to be emphasized and shown to them. We have created a bit of a nanny state thinking in Canada…but the government can only do so much. You need to do the rest and there are many easy ways to do that if you start young. Parents…start talking to your younguns and get them started on a savings plan, be it ever so small to start with. We all have a vested interest in getting this right. Why is it taking so long?